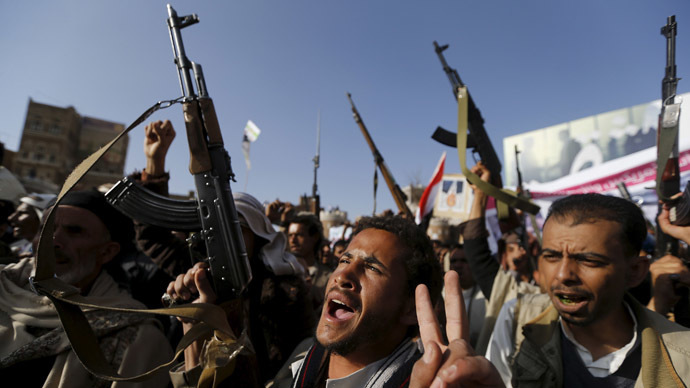 Saudi Arabia and its allies have launched airstrikes in Yemen against rebel Shiite Houthi forces gaining more ground. The mainly Gulf coalition, which also includes the US, is trying to help embattled President Abed Rabbo Mansour Hadi. Countries such as the UK and US have given almost unlimited backing to Saudi Arabia, a fact that massively exacerbates the situation in Yemen, Charles Shoebridge, a former army officer, broadcaster and writer, told RT. Yemen's defense ministry in Sanaa has been hit by the coalition's airstrikes, witnesses tell AFP. The ministry is controlled by Shiite rebels and allied troops. Three explosions were heard as warplanes hit the building in central Sanaa and thick smoke billowed over the area, the witnesses said. Houthi rebels have detained 122 pro-government activists and political figures after raiding residences and offices across the Yemeni capital, the Sanaa Legal Right Center said, according to the Washington Post. An American has been killed in a mortar attack in Aden, CNN reports. The 45-year-old Jamal al-Labani is believed to have been the first US national to have died in the conflict thus far. Al-Labani was hit in the back by shrapnel from a mortar shell when he was returning home from mosque prayers, his family said. The Saudi-led Arab air campaign in Yemen is engaging Houthi rebels’ positions at two strategic locations, at a sea port and an airport, military sources told Sputnik. More than forty people were killed as a result of fighting near the Aden port on Sunday. According to a pro-Hadi militia source cited by Reuters, 36 Houthi militants as well as 11 fighters loyal to ousted Yemen President Abd Rabbuh Mansur Hadi combatants were killed in the central Mualla district near the port. Houthi militants had advanced towards the port, but were pushed back hours later towards an army base. Houthi forces managed to slowly advance towards the city’s center despite the sustained 11-day Saudi-led air strike campaign against them. Aden had been one of the few remaining footholds for Hadi-supporters. After being forced out the capital Sanaa, the erstwhile Yemeni leader had been lying low in the southern port city. He fled to Saudi Arabia last week as Houthi forces advanced and violence in the area escalated. The International Committee Red Cross (ICRC) has secured the support of the Saudi-led coalition to bring in vital medical supplies and aid workers to Yemen, according to Reuters. “We have received permission from the coalition for two planes now, one carrying supplies and one with staff,” ICRC spokeswoman Sitara Jabeen said.